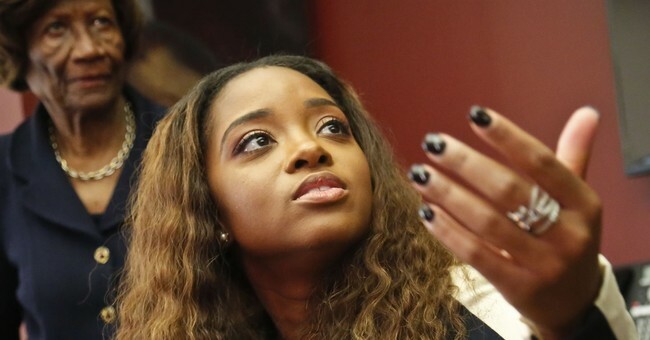 Women’s March leaders Bob Bland and Tamika Mallory appeared on “The View” Monday and responded to questions about the group's ties to anti-Semitic leader Louis Farrakhan. Mallory once again failed to directly condemn Farrakhan's anti-Semitic comments. She went on to argue that her attendance at the event didn’t mean she agreed with what was said, despite her other remarks praising Farrakhan. “A lot of people — and by a lot of people I include myself — think you’re using your organization as anti-Semitism masked in activism and you’re using identity politics to shield yourself from criticism,” McCain said. “Do you condemn Farrakhan’s remarks about Jewish people?” McCain asked. “Yes, and we have repeatedly, in statement after statement this year, which are available directly on our website for anyone to read,” Bland claimed in response. However, Mallory would not specifically condmen Farrakhan’s remarks about Jewish people in her reply to McCain. “To be clear, it is not my language, it is not the way that I speak,” Mallory said. “View” host Whoopi Goldberg later asked Mallory if she planned to step down from leading the Women’s March. The movement’s original founder, Teresa Shook, recently called on the group’s leadership to do. “I am willing to lead until my term at Women’s March is up,” Mallory replied. Bland and Mallory told “View” host Meghan McCain that the allegations of what was said in that first meeting were untrue. However, in earlier comments to The New York Times, the group’s leaders admitted that the role of Jewish women was discussed in their first meeting. “Since that conversation, we’ve all learned a lot about how while white Jews, as white people, uphold white supremacy, ALL Jews are targeted by it,” Mallory said in a statement to The Times. That comment earned her another round of criticism. The Women’s March continues to lose high profile support over their ties with anti-Semitism. Some of the group’s sister marches have been cancelled due to the controversy. The Southern Poverty Law Center and Emily’s List are not partners of the march this year and actresses Alyssa Milano and Debra Messing have also pulled their support of the march. One Women’s March partner, Planned Parenthood, announced their continued support of the organization despite the anti-Semitism controversy.